The Honors in Action Theme Award recognizes chapters whose Honors in Action Project Award entries scored highest in each of the eight Themes related to the 2016/2017 Honors Study Topic, How the World Works: Global Perspectives. Iraqi native Aemah Badri is driven with the desire to succeed. The petite 25-year-old Georgia Perimeter College student efficiently organizes her time for her studies, tutors others, is a leader in the Math, Engineering and Science club, and is active in the Phi Theta Kappa Honor Society and GPC’s Math, Engineering, and Science Achievement (MESA) organization. Badri does all this, while maintaining a 4.0 GPA. Georgia students were honored March 3, 2016, at the All-Georgia Luncheon. Keynote speaker State Representative Keisha Waites spoke on the importance of education, and described her own time as a student within Georgia’s college system, and how that experience contributed to her success. As always, the Georgia Region offers its sincere thanks to the Coca-Cola Scholars Foundation, without which this event could not happen. Students from across Georgia were honored Thursday, March 12 at the Sloppy Floyd building in downtown Atlanta, overlooking the State Capitol. In addition, Aemah Badri of Georgia Perimeter College was selected as a 2015 New Century Scholar and will receive a $2,000 scholarship, and Kaitlin Spivey of South Georgia State College was chosen as the Coca Cola Silver Scholar, and received a $1,250 scholarship. Each student was named to the All-Georgia Academic Team, sponsored by the Coca Cola Foundation and Phi Theta Kappa, and receive a medallion and commemorative certificate. In attendance were college administrators and students from across the state. Kaleb Wilkes, an alumnus of South Georgia State College, served as keynote speaker. To be eligible for this honor, students must be nominated by their college to the All-Georgia Academic Team. Nominees are selected based on leadership qualities, community service and outstanding academic performance. Students nominated become eligible for the All-USA Academic Team, the Coca-Cola New Century Scholars Scholarship, and the All-USA Community College Academic Team and Coca-Cola Community College Academic Team scholarships. These programs award over $300,000 in scholarships every spring. Our congratulations go out to Justin Jones, chapter president for Georgia Highlands, and a Georgia Regional Officer. His poem, “Lunacy,” was selected for publication in the 2014 edition of Nota Bene. 2014 is the third year in a row a Georgia member has been featured. Visit the Nota Bene archive to read Justin’s poetry, as well as other superb poems, short stories, and essays. Again, huge congratulations to Justin for his accomplishment! The Coca-Cola Leaders of Promise scholarship program provides new Phi Theta Kappa members with financial resources to help defray educational expenses while enrolled in a college in order to develop leadership potential through participation in Phi Theta Kappa programs. The program awards up to 200 scholarships of $1,000 each, a total of $200,000 in scholarships annually. Of these awards, 25 scholarships are earmarked for current members of the military or military veterans. Members may begin applying for this scholarship in March, and applications are due in May each year. An independent team of judges reviews the applications to determine scholarship recipients. We have all heard stories about how parents try to provide an unfair advantage for their children in a variety of areas (education, athletics, the arts, etc.). This project brings the problem of “cheating parents” to the forefront by investigating the foundations of competition and calls for increased awareness and implementation of remedies to this problem. 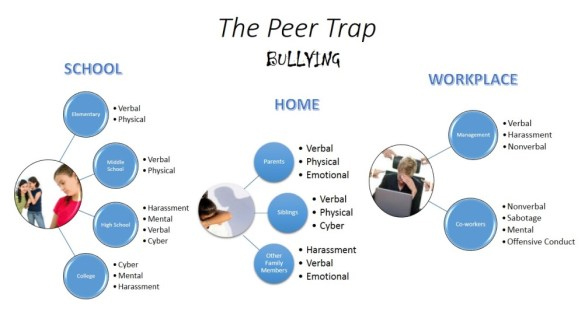 What we did was look at how bullying has impacted children, as well as adults in the home, workplace and school. We researched the emotional and physical impact of bullying and the resources available to bring awareness to this problem and solutions. Our team looked as not just the psychological effects but the social effects of bullying as well. We divided our research into three areas, school, family, and workplace. With the collaboration of the instructors of our Social Sciences Division, we presented a panel discussion on bullying, offered resources and handouts to our campus life and the community. The Distinguished Honors in Action Project Award recognized the top chapters whose entries demonstrated excellence in academic research, leadership roles, service learning and collaboration. Beta Beta Tau’s Honor in Action team kept the HiA rubrics to the forefront as we developed our topic. Where we were asked for 8-10 resources in total, we set a goal for 8-10 for each phase of our research, which included websites, books, journals and databases. Each phase of our study topic had a different leader. We developed and included the following as part of our study topic. Our chapter may have developed the study topic, but we were all inclusive in the delivery of it, so the benefit was not just campus-wide but community-wide. 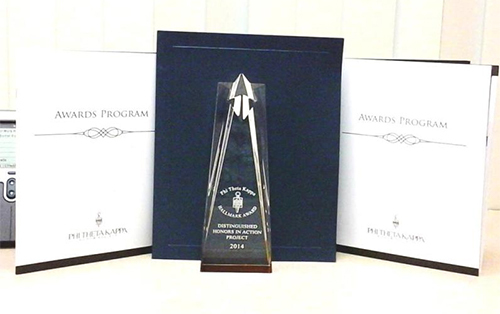 The Distinguished Chapter Award recognizes chapters that submit Hallmark entries in both the Honors in Action Project and the College Project. The average of the two scores determines the top 10 percent of the overall ranking of all chapters. These scores are determined by an independent panel of judges, both in the region and internationally. You must make sure that you look at the rubrics and determine if you have achieved the highest points possible for each project. Before we submitted our Hallmark entries, we review our entries and had others not associated with the chapter review them and rank them according to the rubric points. This gave us an opportunity to tweet and/or improve on what we had. Diversity and going beyond what is expected makes good submissions. Continue to develop opportunities not just within the chapter but outside the chapter. Determine the strengths and weaknesses of your members. Allow every member an opportunity to develop and learn leadership skills by delegation. Set small short-term goals that everyone can develop. Encourage members and non-members to complete the Leadership Study program through Facebook. And for members to complete the Five-Star Competitive Edge program. Make sure that your chapter is well rounded in activities that promote service, leadership, fellowship, and scholarship. Photos and Written Summary Submitted by Janet Walker, Regional Officer of Chapter Relations. 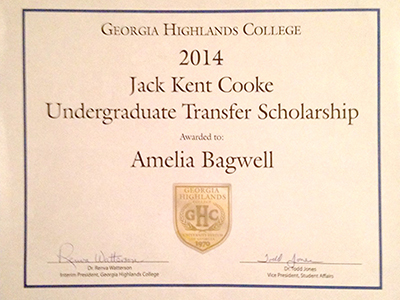 Congratulations to Regional Vice President Amelia Bagwell, winner of the Jack Kent Cooke Transfer Scholarship!